Should you do your own PR? If you’re a startup or a small business owner, hiring a PR company is not practical. It’s far simpler (not to mention inexpensive) to do your own PR. Often, they act like they know everything. They take more credit than they deserve. Whether you are an entrepreneur or run a small business, there are far better ways to get media attention. Small business owners like you pay on average $12,000 a month to get maybe 20 hours of work a week from a PR agency. This translates into maybe three or five stories a month if you’re lucky. To be perfectly honest founders do not need to hire a PR firm to get media coverage. They can easily apply several media relations strategies to successfully execute what a PR person does – build a long-term relationship with the media- themselves, or teach an employee to do this. Whether it is to engage your customers, clients, and influencers with a specific message, build a personal brand or publicize your message to a specific target audience, you can do it without shelling out a huge retainership for an agency. Bonus: If you do your own PR yourself you’ll do a hell of a better job at it since you know the story MUCH better than any PR company. I lost faith in PR firms 6 years ago and have been doing my own PR whenever I need it; it has worked much better. As an example, I just finished a study which found that a used Tesla Model S costs on average $30,000 more then a brand new Tesla Model S. It’s a hot study, it’s surprising, and I want reporters at different media houses to know about it. 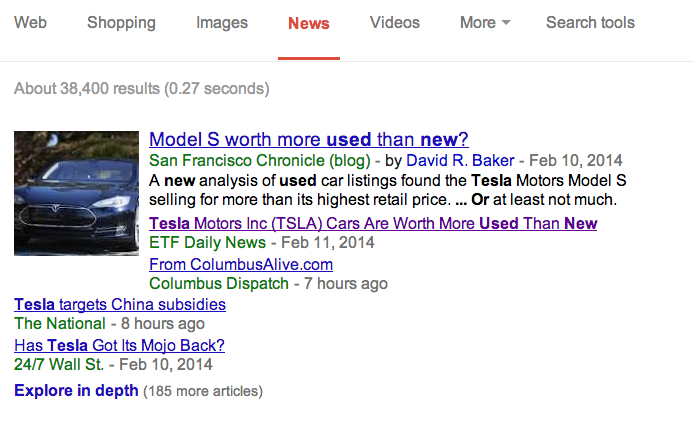 So I do a Google News search for “Tesla new vs used”. This is a better strategy than doing a random search in other search engines since it delivers more relevant results. I click on the articles in Google News that look relevant to my pitch about the Tesla model S study. I’m trying to find a very good fit, a reporter that is really interested in Tesla and new vs. used pricing. If it’s an article about Elon Musk’s statement about Tesla restoring electricity at a Puerto Rican children’s hospital, this is not a good fit. If it’s an article about Tesla’s recalls or Tesla’s business model, it’s also not relevant. Finally, if it’s an article that is older then 3 months or so, chances are it’s not relevant. I’m looking for something that was written recently, that is about Tesla’s pricing of used vs. new. It has to be very relevant; this is vital when you are doing PR for your business. Is it timely? Is it relevant? And is it interesting? Why would someone like you be interested in reading this? Again, we’ll take my startup, Grasswire, for example. Grasswire is an Internet newsroom that lets everyone fact-check and sorts social media content in real-time. But what does that mean? What Grasswire needs is an Internet newsroom. But what Ggrasswire is is a democratization of journalism and information. It’s turning over the power of governments and corporations to everyday people. It’s letting ordinary people control the information that determines how they see the world. Not many people want to read about yet another social media tool. People love to read about freedom. The next step is to find the name of publications your target audience – the journalist – writes for. This part is easy, I look through the article to find the name of the person who wrote it. Sometimes it’s a person from another media house, for example, it might be a Bloomberg business reporter who published something on USA Today. Since we are trying to find journalists who write about Tesla’s pricing model, they would in all probability be a business or financial journalist. Keep this in mind, since every journalist has a specific beat or field they write about. This is relevant for your pitch as you don’t want to target a reporter who usually writes on Tesla’s designs or engineering aspects. Determine whether they’re a freelancer or a reporter for a specific publication. Pay attention here, click on the reporter’s name to view their profile to see which publication they write for. Sometimes the email is hidden in a pull-down menu under the name – check for that. Verify it by checking their Twitter profile. They may also be a freelancer, which means they have a personal email address and not a publication one. This is a crucial part of your email when reaching out to the press for your business. They’ll either open your email or ignore it after reading this. They have 287 emails to go through that day, their chat client is blowing up and they need to write 4 stories. Your email has to capture their attention. don’t you hate it when people pitch you story ideas [insert their first name]? This is where most email pitches fall apart. Business owners put an entire press release in here or three detailed paragraphs of their project plan, or just a bunch of links to show how legit they are. Remember they have 287 emails in the inbox, IM client blowing up and 4 stories to write. They have no time to read through detailed emails or click on any links about your product. Pretend you bumped into them at a conference, you said hello and they responded, you shook hands and now you have 15 seconds to capture their attention. Your comment can get two responses: “Thanks, I’ll pass this along to others” or “I had no idea, that is fascinating!” What do you say? So here you need to appeal to the reporter’s interests when you run your own PR campaign. You might want to look through their profile, see other types of articles they write, questions they ask, things they tweet to get an idea of what types of things would pique their curiosity. For instance, if you are a fashion designer who uses a pop-up shop to sell her product rather than rely on social media and e-commerce, and you find out that your target reporter is interested in unique methods brands use to reach out to the public, you have a great starting line for your email pitch. There is no perfect email template, you just have to play around with it. But never send an entire press release in the email, even if a PR expert or publicist insists that you do. You recently wrote a great article on Teslas, I really enjoyed your analysis on its affordability. We just completed a study and discovered that the average price of a used Tesla is $30k more than a new Tesla. Thought this would pique your curiosity. I could keep on going with reasons you should blog about us but I won’t overwhelm you with details. If you’re interested, let me know and we can set up a time to chat when you’re free. P.S. I think I have 7 seconds to spare still, so if you could just hit the reply button and let me know what you thought of my pitch, that would be great. Even if it is “F-off”‘ any feedback would be great. My name is Austen from Underwater Audio. We developed a technology that makes iPods completely waterproof ‘” it’s some pretty cool technology you (and your readers) would love. We’re at underwateraudio.com, and I have a [product sample] I’d like to send your way to [review/check out] if you’re interested. Let me know! This is mostly a mechanical task, but it is crucial if you want to build solid relations with your target audience, in this case, journalists. It does require some work but all good things do, so let’s get crackin’! The most obvious place to look for a reporter’s email address is at the top or the bottom of the story or blog post where their name appears. If it’s not there, click on their name to look through the bio page for them, the email might be there. If not, look at their Twitter profile, it might be there. Else, go on to the next bullet. If you haven’t yet, install Rapportivein Gmail in order to go forward with this step. Remember step #3 where you identified if the reporter is a freelancer or has a full-time job? If they are a freelancer, chances are they use their Gmail address for emailing. Follow this video below from folks at Distilled along with this spreadsheet to guess their Gmail email address. Type in “gmail.com” into the domain field in the spreadsheet. If they are not a freelancer, meaning on their bio page it states they write for that publication, try the same approach as above with Rapportive and the spreadsheet. If no luck, go on to next bullet. Head over to http://email-format.com and type in the domain to get an idea for the email format to use for that publication. You can then substitute their first and last name into the email format and give those a try. If not go on to the next bullet. If all else fails, there is a way to use Google+ to contact press people privately. You do not need to be connected with them to reach out. Find them on Google+ and reach out with your message. I’ve covered the email finding process in more detail in this post. Now you’re all set to reach out. You have a very relevant and timely pitch for the reporter that is a perfect fit for your topic or product. You have a very short and actionable email ready for them to read and give you a Yes/No reply. And you have their contact information. The last step in getting press coverage is to send that email. Quick tip: You might want to install MixMax to see if they opened your email. If you sent five emails and three of them were opened but you didn’t get a response within a few days you probably need to change who you reach out to or your subject and email style. Thanks for the article, this is very helpful for a startup, awesome info! Curious do you find that emailing them in the morning works better vs. during the day or evening? Does timing play into this? Yup, you got it, I found that timing matters a lot with this type of reaching out. Mornings are usually good, during the day and evenings is worse. This is where tools such as Yesware can help you gauge your efforts – you can see if they are opening your emails or not. Love the approach, going to give it a try. I love how you base your reaching out efforts on the articles they’re written recently, makes the connection much more relevant. Thanks. No problem Alissa. You got it exactly, if they’re written about something relevant to your news or launch chances are they might be interested in what you have. If they have not, don’t bother trying to reach out. Very cool, I’m really glad I found your blog. Your info is super helpful and I like your ‘no-b.s.’ writing style, I look forward to more from you! Great tips. Neil is always adding value!! I think it helps having social credibility you can reference!!! You make the fundamental error of believing writing articles (or even press releases) is public relations. Actually it’s just a small part. PR is about building brands and credibility. If you’re serious about being successful you need a solid PR strategy that works. Also, DIY PR isn’t “free.” If your time is worth, say, $250 an hour and it takes you three hours to write an effective article plus another hour to research and place it, that article cost you $2,000–$1,000 for the time it took plus another $1,000 that wasn’t spent on your business. A good PR firm would charge way less and undoubtedly do a better job. I’m not saying that writing articles or PR releases is PR. I’m just offering an alternative for bootstrapped startups which do not have a budget for PR. Very useful. What do you recommend as the maximum length of the subject line? Do you think its ok if part of the subject gets cut off in a mobile view? Hey Diane, I typically say 60 characters or less for the subject line, you of course want test and make sure it doesn’t get cut off on mobile view. Subject line is your first and main focus for writing a good email pitch for a journalist. The subject line will make or break your outreach campaign so you need to fine tune it and test it for days, maybe even weeks to figure out the best one which is getting opens. Make sure that you’re measuring opens of course to inform yourself on whether your subject line is performing well. We do this in JustReachOut – when a customer is sending emails to journalists we measure their open rates on their pitches and if a pitch’s subject line is receiving poor open rates we contact the customer and help them with re-writing their subject line. Dmitry what if there are two journalists convering the same beat in a single blog? Their beats sort of overlap. Are there any criteria to determine who I should approach? Sure, I’d look at the last three articles someone has posted and figure out if their overall focus for the last few weeks is related to what you do or what you’re pitching. Just because someone else covered a topic – it doesn’t mean they are really interested in this topic, so you you should do some digging and figure out which one of these two is truly interested in what you’re about to say. Pretend you’re going to meet them at a conference face to face, what would you say to them the first time you meet one? Which one would you approach? I hope this make sense. Please ask any follow up questions. I like to help folks with this stuff. Thank you for providing so much detail Dmitry. Many blogs such as Inc and Entrepreneur have staff writers as well as contributors who cover the same topic. Which of these two is more likely to respond to a pitch – in general?